The well-paced plot of this debut police procedural by Mark Hardie introduces us to the first in a series featuring DS Frank Pearson and DC Catherine (Cat) Russell. Set against the backdrop of a bleak Essex seaside town, it explores the themes of corruption and murder within the police force and the failure of our social care system over the children it is supposed to be protecting. Told from multiple viewpoints, but largely DS Pearson and DC Russell, the main story focuses on the investigation of the burned body of Sean Carragher, a policeman who is under internal investigation for fraud and misconduct. Alongside of this is Donna’s story. Donna believes her friend, Alicia, who died the previous year, was murdered and is trying to get the case reopened. As the investigation explores the true character of the murdered policeman it becomes clear that any number of people had the motive to kill. The book opens with the shocking scene of someone being set on fire in a car on the sea front followed by the start of an investigation. It is worth pointing out that although the story begins in such a grim way it is not a book full of gratuitous horrific scenes. 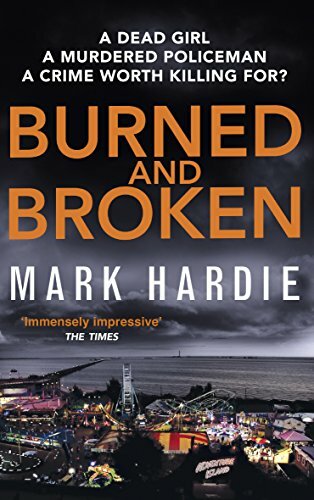 Mark Hardie’s clipped writing style gives the book great pace and the matter of fact dialogue in the police station comes across as totally credible. All of the characters are believable but all have their flaws, from the DS struggling to come to terms with the possibility of prostate cancer and the DC under suspicion of being involved in corruption to the isolated and disturbed character to Donna, a sixteen year old in her first year of living outside of care and apparently abandoned by the system. With the twists and turns of the various plots and subplots this is one of those books that you have to concentrate on. The addition of timeline shifts between the investigation and the events that led up to the fire (including scenes told from the viewpoint of the now dead man) may not appeal to everyone but is an interesting technique for layering the reveal of information to the reader rather than one lengthy explanation at the end. A thoroughly enjoyable read.